Listen with empathy, and use a team approach to assess and address an individual’s pain. Physical medicine, nutrition, acupuncture, healing touch, chiropractic, biofeedback, etc. It’s not necessary for physicians to have all the answers. Use a holistic team approach to help the patient. Pain. It permeates every aspect of medicine, crawls into the deepest corners of our practices, sinks its claws in and stays put. Opiates are at the center of a vicious national debate, and our patients are trapped in its clutches. But my thoughts are less on medications, protocols, and procedures and more on how we approach the patient who cries pain. Through everything I have observed, as a caretaker and student physician, I have come to a concerning conclusion: The burden is on the patient to prove his or her pain. She was right. When a patient has any sort of pain, our question is always, “On a scale of one to ten, how bad is it?” They answer, and we immediately judge whether the number fits the presentation. Does the patient really look like an eight out of ten? Are they writhing in enough pain to satisfy us? This is a ridiculous routine. Do not ask and then ignore what they say. Obviously, clinical judgment is an indispensable tool, so if a patient comes in with 10/10 pain but they are resting at ease on the emergency room stretcher, you can likely delay the exploratory laparotomy. But consider assessing their pain in context. I recently saw a young lady who called her abdominal pain 10/10, but was interacting pleasantly, with no grimacing nor guarding, and only occasionally rubbing her right flank and flinching when the pain periodically recurred. On further exploration, she had never in her life experienced any significant pain – not even a sprained ankle for comparison. For her, this was the worst pain she could imagine. Conversely, the judgment that follows mention of 12/10 pain is always the same: “There is no twelve,” we say out in the hallway, “they are just being dramatic.” But if we already ignore 8/10 pain, it follows that a patient may declare twelve out of ten pain to get our attention. My sister demonstrates a useful paradigm. She is in chronic, bone-deep pain at all times. Her joints ache, her muscles spasm, her head pounds… daily. She suffers from Ehlers-Danlos syndrome and is in constant agony, but was blessed with a spirit that keeps her motivated and enables her to present a deceptively happy face. When she submits to going to the emergency room, we know she must be in unimaginable pain: pain bad enough that it is worth the mistreatment she will endure. Why? Because she internalizes her agony and thus she does not fit the stereotypical picture of a person in pain. So doctors write her off as exaggerating when she quietly uses her words. She does not appear worthy of their time. I recently cared for a cranky elderly patient who had been reporting pain for days. At first, every question was met with a glare and a growl, but I was determined to be thorough and tried my hardest to coax out the quality of the pain. After several days of this, we had a breakthrough: the patient began to cry while describing shooting, burning pain, plus aches and cramps that made physical therapy too daunting. I returned to my chief and asked to change the patient’s orders: in addition to the typical opiates, I added gabapentin for neuropathic pain, muscle relaxants and heating pads for the cramps, and a B12 titer to address the paresthesias and fissures at the corners of my patient’s mouth. Impressed with my initiative, the chief agreed. When I arrived the next day, the labs showed a B12 level just below normal limits; I had been right. I went to see the patient and was met with a hesitant smile. The new regimen was beginning to work. So what is the “right” kind of pain? I once witnessed a resident describing an ER patient with pelvic pain as “actually not that crazy looking,” as if her presentation automatically implied mental instability. When my team told her the “good news,” that she could go home because we had not found any pathology, the patient, with a tortured expression, I will never forget, explained that it was not good news because we had not given her any help, any answers, or any hope. I trailed after my team as they left the room, embarrassed to be associated with them. These attitudes are not universal, although it can feel that way to the patient. I strive to emulate physicians who approach patients with respect and an open mind. One such attending once explained how everyone has his or her own way of coping. “Some patients shout about it, some get very quiet, others look distracted, and still others joke about it, so you cannot take anything at face value.” It was some of the most important advice I ever received. The best-case scenario is when pain has an obvious source and will resolve naturally, as with fractures and post-operative pain. But when patients start to complain disproportionately, or when no clear cause exists, we start to write the patient off in our minds. We run our battery of tests, while rolling our eyes. I believe the solution starts at the foundation, as soon as we begin medical school. We need exposure to these patients, to understand what we are facing, so we are not surprised when we reach intern year. We must hear their stories, of mistreatment and misjudgment. Treatments are limited and outcomes are often poor; thus, our burden is enormous. We must stop the cycle, and we must remove the burden of “being believed” from the patient. We are the providers, and it is time to change how we understand and treat pain. Sarah Cohen is a medical student. NPR’s This American Life has a beautiful example of how family caregivers (and professionals) are using the basic tools of Improv engagement. Health practitioners are increasingly being evaluated for their ability to accept feedback, adapt to change, handle stressful situations and establish rapport. Medical Improv builds the skills needed to handle these difficult situations, interact with diverse cultures, and become sensitive to ever changing healthcare environments. The medical industry is also faced with data measurement that assesses the quality and cost of care in order to determine reimbursement rates. 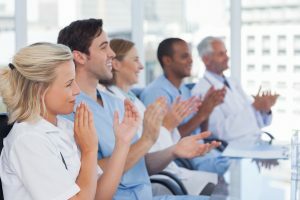 This ongoing trend is pushing organizations and practitioners to improve their interpersonal relationship skills in order to create positive patient experiences at every level. Preparing for unpredictability is the paradox shared between health care practitioners and improvisers. Improvisational theater teaches every professional to accept uncertainty and ambiguity as conditions of performance, rather than trying to enforce order on something that hasn’t happened yet. Participants are told they have all the information needed for a scene, and no one is “wrong”. Risk-taking is supported and applauded as the improvisers step into the abyss of the unknown! It’s probable that most people think of improv as comedy, so the term “Medical Improv” can be confusing. Comedy is focused on humor, whereas improvisational theater is focused on honesty and spontaneity. What makes improv so enjoyable is how the participants behave, which in turn makes us laugh! That’s why Medical Improv is considered “serious play”… the method is fun, but the content is serious. Listening, observing, and being emotionally present are essential. It’s an art form and a skill set, a performance and a practice. The chosen Medical Improv exercises develop self-esteem, spontaneity, problem solving, empathy, collaboration and professionalism…..all the attributes needed to create productive, open, and trusting partnerships. “Yes, and”, rather than “Yes, but” or “No”. Denying another person’s idea can stop a scene dead in its tracks. Build on your partner’s suggestion by affirming, rather than negating. To be “present” for others with the gift of mindful listening. The need to surrender individual “plans” in order to co-create together. To see “failure” as opportunity…to learn, be human, forgive, and help. Healthcare may be structured, but it can’t be scripted. By reinforcing the skills of listening, observing, cooperating and adapting through the “serious play” of applied improvisation, safe, quality patient care becomes a reality! Stephanie Frederick, RN, M.Ed., received Medical Improv training at Northwestern University’s Feinberg School of Medicine in Chicago, Illinois. She is CEO of Improv to Improve Healthcare!, and offers presentations, workshops, and consultations throughout the U.S. and Canada. Visit www.stephaniefrederick.com, and contact Stephanie at stephanie@stephaniefrederick.com to arrange an initial free consultation to discuss your organization’s needs. This is a national discussion that needs to happen! In my advocacy business I gather a detailed health history and review medical records. I put the information on a thumb drive for my patient-clients to carry with them. Providers appreciate this as it offers a medical history, current list of medications, specialist referrals, critical labs/procedures, advanced care instructions, and more. The United States has some of the best healthcare systems, minds, and clinicians in the world. Great bio-informatics and healthcare innovations and technologies spawn daily to assist with patient care, continuity of care (or care coordination) and research across multiple divides in efforts to provide better care and outcomes for patients. But they are strained by one major thing, a true universal patient identifier. The U.S just hasn’t adopted or progressed in this area as well as others. It’s no fault that other countries have ameliorate methods for care coordination. It’s actually pretty simple. The European Union (EU) along with other participating countries offers their citizens a European Health Card. This identifier along with its shared data is utilized across multiple systems, clinicians and even countries. If an unknown or unconscious patient gets in a car wreck in the EU the medics can swipe this card which holds all the patient’s demographic and up-to-date health information. They know the patient’s history, disease & medication list, advance directives, et cetera, right on the spot. They can even transmit or transfer that patient information along with any treatments given at the scene right into the accepting hospital’s system while in route. From there the continuity of care just continues on and improves. Maybe it’s been here all along, circa 1935 to be precise. The Social Security number? Scheduling a specific appointment to discuss EOL issues is excellent advice. It offers everyone an opportunity to take a deep breath and recognize there will be a very important conversation about to happen. If more people did this, insurance companies (and all of us!) would see how critical it is to offer community programs for discussion, and how everyone over the age of 18 should be encouraged to complete an advanced care document. Agingwithdignity.org and theconversationproject.org are both excellent resources. One of the most important conversations you will ever have—and also the most difficult—is to share your thoughts and feelings about the end of your life. The people closest to you need to know what you want for your last days so that they can advocate for your wishes, if you, for any reason, are unable to speak for yourself. This conversation could help you avoid being kept alive for months on a ventilator with a brain that no longer functions. Your loved ones will only be able to protect you from excessive futile medical care if they know that this is your preference. Read more here about having an end-of-life discussion with your family and friends. But talking with your personal health care professional about your feelings and wishes is also essential. Your provider may be part of the medical decision-making team at the end of your life and will know, in alignment with your loved ones, what choices you would make for yourself. In addition, your medical practitioner can offer you valuable advice about your current state of health and the tough decisions you may need to face in the future. 1. Don’t wait for your provider to bring it up. You will most likely need to initiate this end-of-life discussion. Even though there is a current movement to encourage doctors to have these conversations by providing Medicare payment, studies have shown that only about 14% of physicians are engaging in advance care planning discussions with their patients. So your care provider might be one of those who are reluctant to start the process. Be prepared to speak up, loud and clear, about the importance of this subject to you. Read more about why doctors struggle with the end of life. 2. Schedule a dedicated appointment for the conversation. Medical office visits for chronic health issues tend to be filled with many necessary tasks like arranging for lab tests, prescription renewals, and specialty referrals. Your doctor is likely to feel too rushed to have this important discussion in the middle of managing your hypertension or other health concern. Your annual physical exam appointment is also not a good time to introduce the subject of end-of-life planning because the provider should stay focused on your current state of health and will probably already feel pressured to cover all the important components of the wellness visit. So, to allow enough time for a more relaxed discussion, you should schedule a separate visit, tell the receptionist that it is for advance care planning, and ask for at least a 30-minute appointment. It may be necessary to reinforce that you have some important health-related issues to discuss with your provider. Your visit with your health care provider will be much more productive and gratifying if you have prepared in advance. Spend some time learning about the options available at the end-of-life and thinking about your own preferences. The Conversation Starter Kit (available at theconversationproject.org) is a great place to begin. Download and print the free kit and complete it before your appointment. You can also sign up for The SMART Decisions Challenge, a free step-by-step program to guide you through completing your advance directives. Learn more about it here. 4. Choose your health care proxy. Decided in advance who you would want to speak on your behalf if you are unable to express your own wishes. Remember to choose someone who will be able to handle that responsibility emotionally and who also will be able to agree with your choices. Talk with that person and make sure they are willing to fulfill this role before your appointment. Also be prepared to name two people as alternates. 5. Print your paperwork in advance. Your state of residence will have specific forms you will need to complete, usually called the Living Will and the Health care Proxy form (or Durable Medical Power of Attorney), though your state may use different terminology. This is the official paperwork your provider will help you complete, so you can save a lot of time if you bring it with you to your appointment. You can download and print the advance directive forms for your state at caringinfo.org. Note that you will need separate forms for each state in which you reside during the year. 6. Bring a list of your questions. As you review the advance directive forms and the Conversation Starter Kit, write down any questions that come up for you. During the appointment with your provider it will be difficult to remember all of the issues that occurred to you before so having them listed will be very helpful. Ask about your own health status and what you can expect in the future. You also might have questions about some of the terms used in your advance directive forms, like mechanical ventilation, artificial nutrition and CPR. 7. Schedule a follow-up visit if necessary. These are complex conversations to have and difficult decisions to make so don’t hesitate to return to your provider’s office for more discussion. It’s important that your wishes be clarified and understood so take all the time you need to accomplish that. Also it is recommended that you revisit your choices and update your paperwork every 5 years or whenever your health status changes. Planning ahead for the end of life is an ongoing process rather than a one-time task, so be prepared to have multiple conversations in the future. For now, the most important step is simply to get started: complete the Conversation Starter Kit or the SMART Decisions Challenge, record your thoughts and wishes, and schedule a time to talk with everyone who needs to be informed of your choices. People who have completed their advance directives say they feel more at peace and comfortable about the future. Get your own planning started now so that you too can rest easy and live your life with less fear. This post is part of Common Grief, a Healthy Living editorial initiative. Grief is an inevitable part of life, but that doesn’t make navigating it any easier. The deep sorrow that accompanies the death of a loved one, the end of a marriage or even moving far away from home, is real. But while grief is universal, we all grieve differently. So we started Common Grief to help learn from each other. Let’s talk about living with loss. If you have a story you’d like to share, email us at strongertogether@huffingtonpost.com. Get top stories and blog posts emailed to me each day. Newsletters may offer personalized content or advertisements.